Wild Roses Bag is the original prototype that I hooked for my 2001 Primitive Spirit Paper Pattern Set entitled Botanical Hearts. It is featured on the cover and is approx. 8″ x 6″. Peony Heart is a prototype for a limited edition kit that was for sale early in the history of Primitive Spirit’s collection. It is a 10″ X 8″ heart shaped pillow. 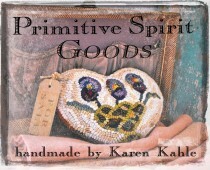 The Hobo Bag is a prototype from an early Primitive Spirit catalog and is 9″ tall by 6″ wide. This Kitten Pillow is a prototype that I made for the Hearts And Littles Paper Pattern Set. The heart shape is 10″ X 8″ and is finished with a yellow and black check wool backing that creates a self-fringe.